That’s what I grew up hearing Canada’s Hockey legend Wayne Gretzky being called. Since retirement, he went into creating a wine estate and has now branched into whisky. Yes whisky. I’ll be honest… I had rather… ahem… modest expectations. Particularly after Sula’s rather unimpressive experiment with shifting from making wine to whisky with Eclipse. However the Canadian nostalgic pride won me over and it made it into the quartet imported to India to share with friends as part of a wee celebration of Canada’s 150 years! To be honest, we couldn’t quite make up our minds about this one. There is something a bit peculiar about it. Definitely different. Not bad but not something you would go “Oh gosh I wish I had more of that!” However it is unique and it isn’t a disaster so am glad it made its way from Canada to India. It was revisited and again, once you adjusted to its slightly different character, it makes a reasonable sociable companion to the evening… almost distracting as it doesn’t quite ‘fit’ the standard whisky categories…. and every sip or two it reminds you of this. A remarkable blend produced from locally sourced grains and finished in red wine casks from the winery which impart a pale amber colour. Expect a smooth and refined flavour profile that includes notes of marzipan, light citrus, vanilla, oak and spice; the finish is long, warming and balanced. It was released October 13, 2016, made in Ontario, Canada by Andrew Peller Limited with a style described as “Medium & Fruity.” It is a blend of rye, malty rye and corn with the current stock from an unspecified Ontario distillery, with plans to distill their own blend coming in the future. The folks over at the the wine estate and distillery recommend serving No 99 Red Cask in a cocktail – the Great Old Fashioned and Top Shelf look like a rather apt combination! I bought this at the 55 Bloor Street LCBO at Ron’s recommendation for CND $39.95. And at that exceedingly reasonable price point (by our standards this side of the globe), it fits the bill for pulling off something ‘different’ at an affordability you are happy to experiment! So not bad at all folks. 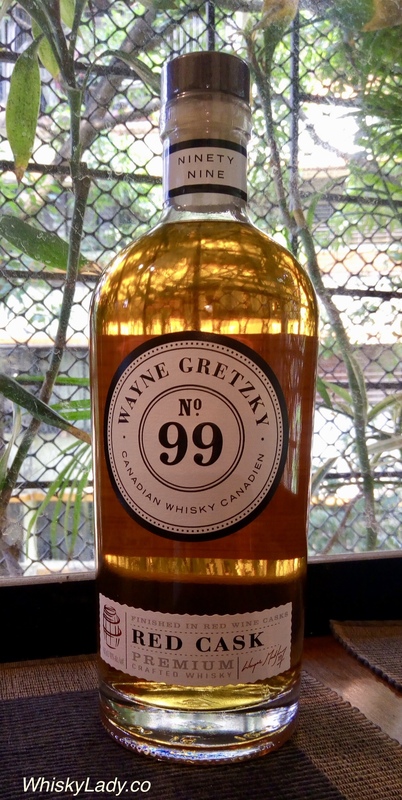 This entry was posted in Beyond Scotland, Canada and tagged No 99, Ontario, Wayne Gretzky, Wayne Gretzky No 99 Red Cask 40% by Carissa Hickling. Bookmark the permalink. Personally I’d recommend trying the Ice Wine Cask or the No. 99 proof one. This is a nice start, however they fill in where this one misses out. Didn’t have a chance to try… and unlikely to find it anywhere in Mumbai, India. 🙂 Will keep an eye out next trip to Canada!